Craving the taste of green chile? Try these green chile pasta noodles made with homemade noodles infused with pureed New Mexican green chile! For labor day, my boyfriend and I flew from Albuquerque to Seattle for the weekend. 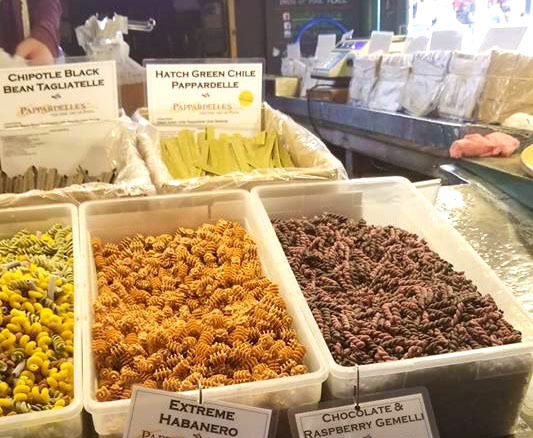 We visited the famous Pike’s Place Market, and while we were there, saw Hatch Green Chile pasta for sale from Pappardelle. And I’m such a green chile nerd that, of course, I had to take a picture! 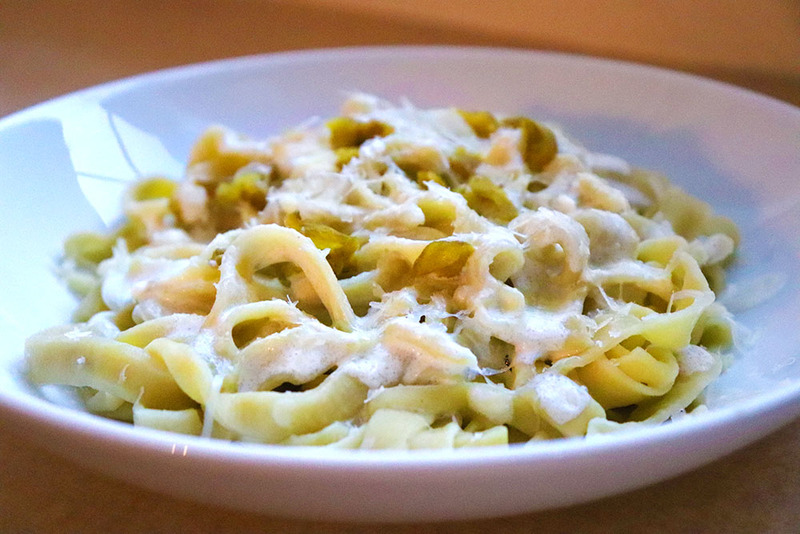 When we got back to Albuquerque, I knew I wanted to try to create homemade green chile pasta noodles! 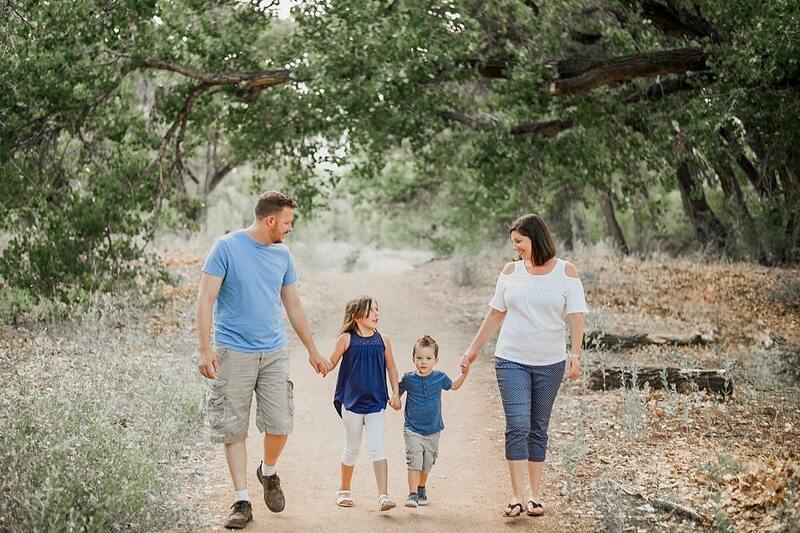 I made them a couple weeks ago and they are everything that I hoped they would. They have a strong green chile flavor, the perfect amount of heat, and they’re just really, really lovely. Surprisingly, they don’t have much of a green tint to them, so when you make this, don’t be alarmed. The flavor is still there! While it may seem intimidating to make pasta from scratch, it really is quite easy and enjoyable! 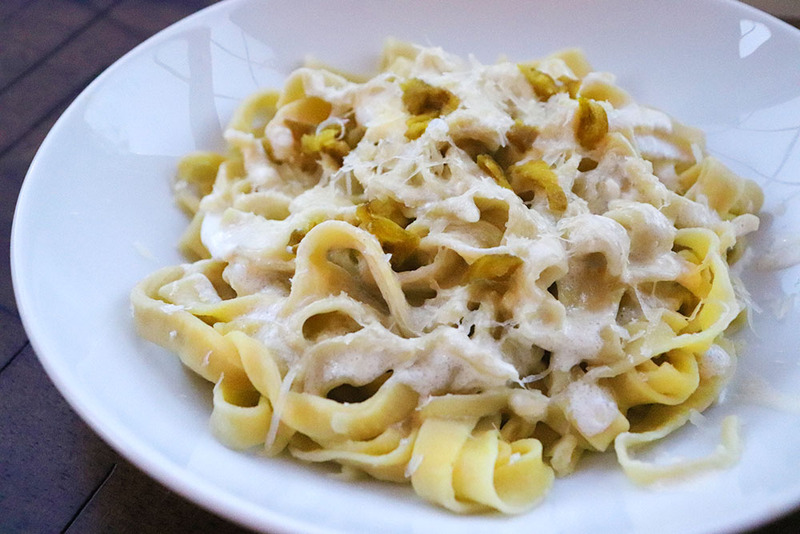 For this recipe, you need to have a pasta maker. I don’t usually like to recommend recipes that require more expensive tools, but I honestly think a pasta machine is a great investment. 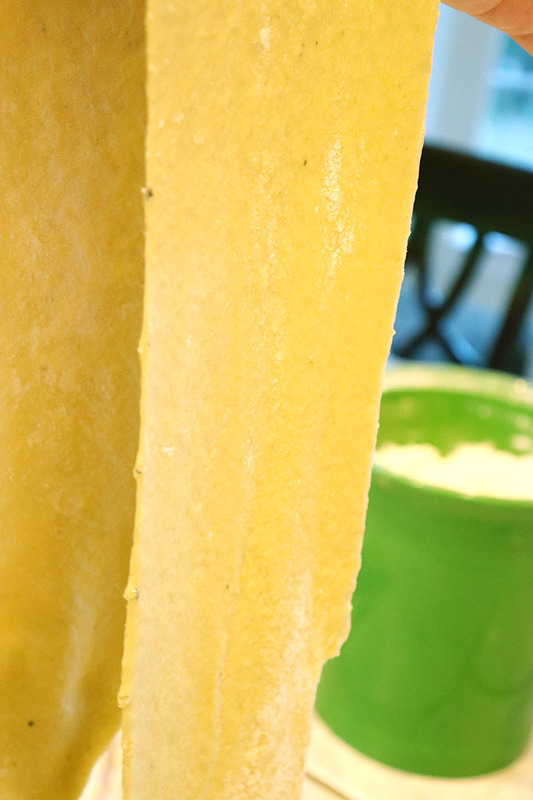 Plus, when you have a pasta maker, you’ll get to enjoy fresh pasta, and that’s just good for the soul. You’ll start by adding 1 cup of green chiles to a blender and blending until pureed. Next, add 1 3/4 cup all purpose flour to a bowl and add pureed green chile, 2 eggs, and 1.5 tbsp of olive oil into the center of the dough. Use a fork to whisk the eggs and oil into the flour, until incorporated. If the dough is sticky, add 1 tbsp of flour at a time, until desired consistency. If it’s too dry, add 1 tsp of water at a time. 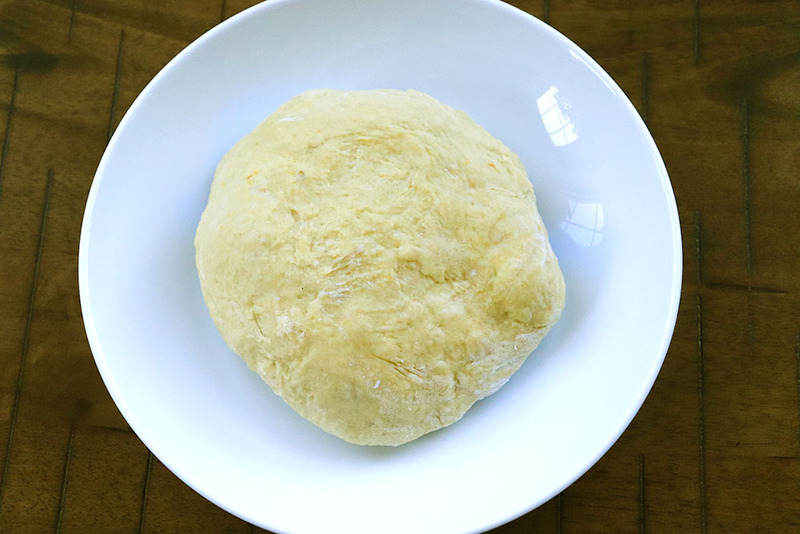 Knead the dough for 8 – 10 minutes, then wrap it in plastic and let it sit for 20 minutes. You’ll follow the instructions of your pasta machine to roll out and cut the green chile pasta noodles into the desired shape (I did spaghetti). Cover the noodles as you’re making them, to ensure that they don’t dry out. Bring a pot of salted water to a boil, then add the fresh pasta and cook for 1 – 3 minutes, then strain. 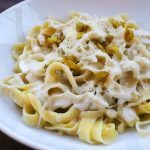 I served my green chile pasta noodles with a homemade alfredo sauce, topped with chopped green chile and it’s a noteworthy dish! I imagine these noodles would also pair well with melted butter, garlic, and salt, as well. Homemade noodles made from flour, eggs, oil, and New Mexican green chile! 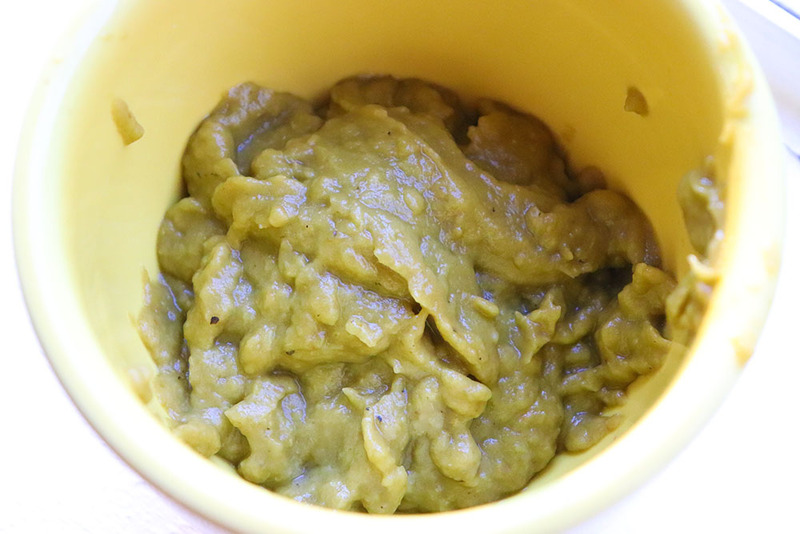 Add green chile to a blender and blend until pureed. Whisk in eggs and olive oil. Add flour to a medium bowl, creating a well in the center. Pour egg/green chile mixture into the center and use a fork to whisk together, until the flour is fully incorporated. If dough is still sticky, add more flour, 1 tbsp at a time, until it's not sticky to the touch. If it's too dry, add in 1 tsp of water at a time. Knead dough for 8 - 10 minutes, then wrap in plastic and allow to sit for 20 minutes. 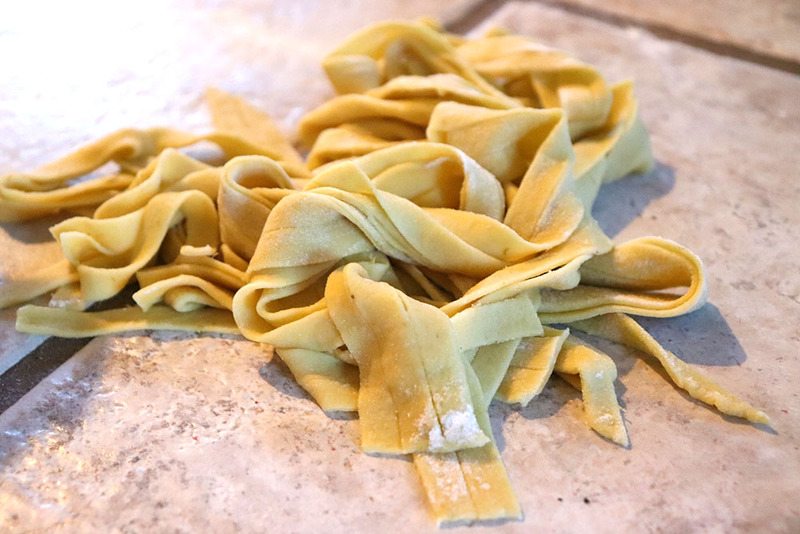 Follow your pasta machine's instructions for rolling out and cutting the pasta, making sure to cover unused pasta dough to prevent it from drying out. Bring a pot of salted water to a boil. Add in fresh pasta and boil for 1 - 3 minutes, until tender and cooked. Want to save this recipe for later? Simply click on the image below to pin it to your favorite green chile board! Did you try out this recipe? Please leave a rating or a comment to let me know how it turned out!